Since seeing Star Wars, Episode VIII: The Last Jedi, I can’t stop thinking about the books we see in the Jedi library on Ahch-To. To be honest, my mind was already going before seeing the movie, since the books stood out in the trailer. I wrote about them over on Forces of Geek based on what we see in the movie, but I still have more to say about them. Phil Szostak reveals much more about those books in The Art of Star Wars: The Last Jedi. Tumblr user Cassiopeia has an excellent post about further details of the Jedi scriptures featured in Szostak’s artbook. (It’s also worth checking out her other Star Wars content.) She discusses the script, manuscript, some illustrations, and a host of speculations about what they all reveal. Building on Cassiopeia’s post, as well as my own examination of the artbook, this is a follow-up on a current obsession (ahem) research interest. Szostak’s artbook for The Last Jedi contains three pages of interest to bibliophile Star Wars fans (61-63). All three offer beautiful spreads of concept art. (I include photos of just a few features.) The first page contains images of the “Tree Library” by Seth Engstrom and Rodolfo Damaggio. The next page includes more specific views of the “Book Nook” by Engstrom and mock-ups of four Jedi books by James Carson. Given the numbering of these images (01, 04, 06, and 07), it confirms that there are at least seven Jedi manuscripts, as shown on the shelf in the movie. Finally, the artbook contains a full-page spread of mock-ups for six pages from the Jedi books by Chris Kitisakkul. In my previous article, I linked the Jedi books to the Middle Ages with the idea that the codex is a thoroughly medieval technological medium. Concept art of pages from the Jedi books confirms those connections as well as presents new ways to extend my argument. Most obviously, these Jedi texts are handwritten in the same way that medieval manuscripts were. This is the basic meaning of the medieval Latin term manuscript, a compound of the words manus (hand) and scriptus (written, from scribo). Before the advent of the printing press with movable type in the fifteenth century (and even competing alongside it), handwriting was the dominant means of textual communication in medieval Europe–a means that continues to persist even now that digital media has become dominant. Most of the content in these Jedi pages is astronomical of some sort. Medieval analogues to the images aren’t hard to find, since astronomy was widespread in the Middle Ages. This area of medieval learning is sometimes more like what we might call astrology, as science and belief merged. It’s also worth noting that science and religion often went hand in hand in medieval astronomy. This is a notable comparison with the Jedi religion in Star Wars, as it encompasses both the Force and study of cosmology. Just a few examples of astronomical lore in medieval manuscripts are relevant, mainly from Western European Latin works. I’ve written about the works of Isidore of Seville (c.560-636) as an example of medieval media, and part of his significance is in transmitting classical scientific knowledge to European scholars in the Middle Ages. As previously featured, one telling example is a detail of Isidore’s section “On the heavens” (“De caelo”) from De natura rerum (a compendium of learning “On the Nature of Things”) in Zofingen, Stadtbibliothek, Pa 32 (9th century), folio 62r. This particular chart shows the heavens as medieval people understood them, in a geocentric model of the universe. The earth rests at the center, while the various outer portions represent the changing of the seasons in the rotation of the heavens around it. Plenty of other astronomical manuscripts also exist from the medieval period. Many are indebted to Isidore’s works, although later authors and compilers continued to build on his knowledge. For example, in a late-ninth-century astronomical-computational encyclopedia in St. Gall, Stiftsbibliothek 250, page 23 contains a related map of the heavens. This image depicts another geocentric model: the earth (Terra) in the center, surrounded by the orbits of the sun and moon, with various constellations around the outer rim. Another astronomical collection appears in Basel, Universitätsbibliothek, F.III.25, compiled in the thirteenth to fourteenth centuries. Several diagrams may be used as analogues to the Jedi texts. One particularly striking chart, much more technical than those already shown, appears on folio 29r. Again, the depiction is of a geocentric model, but it also represents the seasons and positions of constellations relative to the earth. This chart is also more mathematically sophisticated, as it includes numerical information about these astronomical positions. Illustration from an astronomical treatise by Persian polymath Al-Biruni (973-1048), explaining the phases of the moon. In the thirteenth and fourteenth centuries, Western Europeans began to encounter the transmission of Arabic science from the East. The image to the right is one example of such learning–again, an apt analogue for the phases of the moon depicted on one page of the Jedi scriptures. As Latin translations flourished and knowledge spread, it continued to change astronomical science as represented by Isidore and his successors. This manuscript from Basel likely demonstrates those developments. Even more, this depiction of the heavens also demonstrates intriguing affinities with the star chars in the Jedi texts. In all of these examples, the analogues occur not only in the images as diagrams (visual components) but also the textual annotations (verbal components). We see necessary associations between text and image in both the Jedi scriptures and the medieval astronomical works. Indeed, links between verbal and visual elements might be considered definitive features of medieval multimedia. Illuminated incipit from a twelfth-century Quran, Baltimore, Walters Art Museum, W.556, folio 4b. Other than astronomical knowledge, there are even more links to explore between medieval manuscripts and the Jedi texts in The Last Jedi. In some ways, the Jedi pages resemble Arabic manuscripts. Although these are not my specialization (so there’s a caveat), a few parallels stand out. As Cassiopeia notes about the script, “it’s relatively thick and kind of blocky,” which is reminiscent of the oldest form of Arabic calligraphy, known as Kufic. In addition to the type of script seen in the Quran to the left, the folio also presents a kind of decoration at the top that may be seen as a parallel to the golden borders of the Jedi scripture pages. One feature of the Jedi texts parallel to Arabic is the writing of words over top of colored backgrounds, known as illuminated script. 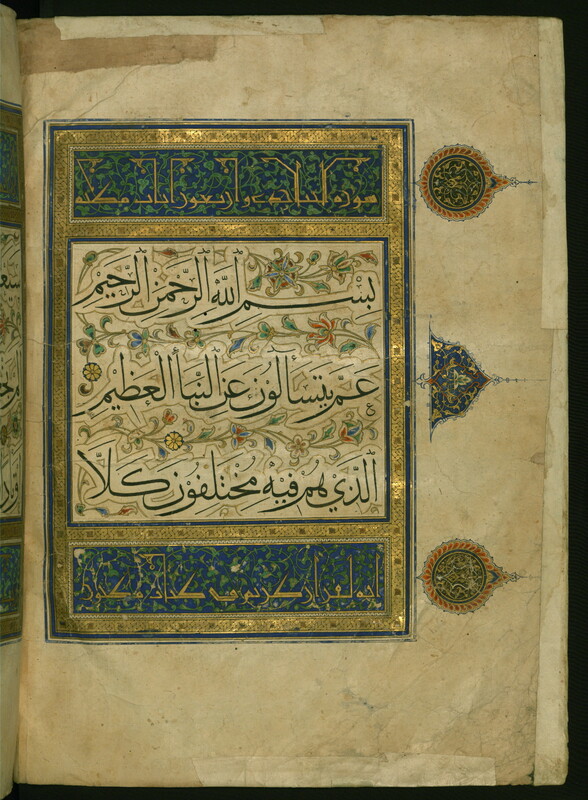 Examples appear in manuscripts like the fifteenth-century Quran in Baltimore, Walters Art Museum, W.562, folio 2b. Here the illuminated Arabic writing is used for the title of surah (chapter) 78 of the Quran. 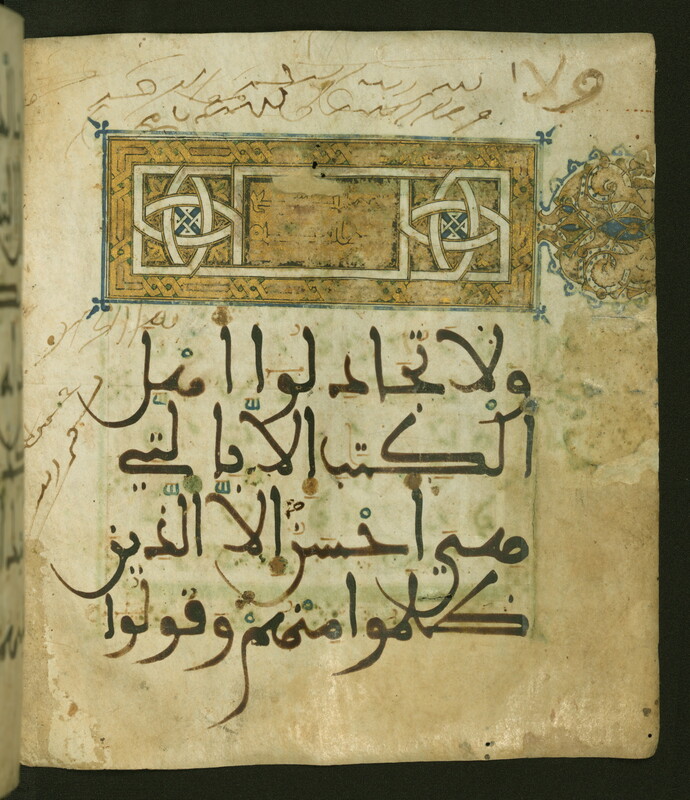 Of course, decorated initials of individual letters exist in Western European manuscripts, but more Arabic manuscripts contain extended writing within illuminated panels like these. A similar type of illuminated script is especially pronounced in the Jedi texts on the last page (without any drawings). A few other initials and smaller units of writing appear on the other pages, too. In a related way, but more generally than my previous points, the last page of the Jedi scriptures resembles incipit pages. These types of pages appear in medieval manuscripts from both East and West, in many different forms and layouts. Common elements include flares like decorative borders, illuminated initials or words, and high-grade display script. All of these features prominently signal the start of a new section or major part of the manuscript. The above folios from Quranic manuscripts give examples of incipit pages from the Muslim world. Another famous example, from Western Europe, is the opening of the Gospel of Matthew in the eighth-century Lindisfarne Gospels (London, British Library, Cotton Nero D., folio 27r). Medieval sacred chants were also prevalent, yet another way that books spoke in the medieval period. After all, chants were needed for Christian worship in monasteries and churches throughout Europe. The example above is for the Ferial Office, from a two-volume breviary composed in Notre Dame, Paris, around 1300, Paris, Bibliothèque nationale de France, lat. 15181, folio 11r. Perhaps this type of chant for the Jedi Code is meant to be represented in the last page of the Jedi scriptures seen in the artbook. With such an illuminated incipit page, it’s certainly the sort of text we would expect. In the Star Wars galaxy, filled with spaceships and laser swords, a world of computers created for hyperspace jumps, the appearance of books holds special meaning. In The Last Jedi, the manuscript is an old technology made new. Just as medieval manuscripts have continued to hold the attention of those who have encountered them over the centuries, the Jedi books will surely continue to hold the fascination of Star Wars fans. I really love this! Thank you for including examples of the astronomical diagrams. I do think that the script is more reminiscent of Coptic or Ge’ez, rather than Arabic. I’d love to know what Chris Kitisakkul looked to for inspiration! Ah, yes–I think you’re right about the script/language type being similar to Coptic or Ge’ez, or perhaps Church Slavonic, etc. That takes me even further afield from my knowledge (though I encounter these types of manuscripts sometimes with apocrypha). I was thinking more about layout than specific script types, since the illuminated words over colored backgrounds struck me as similar to some I’d seen in Arabic Qurans. But a quick browse through some manuscripts over at the Virtual Hill Museum & Manuscript Library (https://www.vhmml.org/) brings up some good parallels in other Middle Eastern languages like you mention. Thanks for the tip! Reblogged this on The (Pop) Culture Medievalist.